Screw beer in October. I don't even drink beer. Carp is my drink of choice and October carpin can be quite tasty. October is like a miracle month on my local river. September always seems to be very difficult but for some reason the carpin seems to perk up for just a short while in October. For no good reason I can see the fish get a little stronger and happier than September and apparently they too honor Oktober-Fest because this is when they get their fall beer-bellies. Small olive soft-hackles were the main ticket for me again today with a little love on the worm but in the past October has been one of my best months for big (3") crayfish patterns like the Primordial Crust dead-drifted or on a super slow swing. You find allot of mature freshwater lobster this time of year in the river and it has always been my theory that carp are going scavenger. They are such a wonderfully adaptable species! This little window of joy does not last long though. November and December are by far and away the hardest months in Colorado, so get while the gettin is good! Or at least not bad. And oh yeah - Stay thirsty my friends. Ugh! OK, time to seriously use something other than the usual, specifically one of a whole bunch of soft hackles I have. I'm glad for your October success! It's a good month in one pond I go to, another I've never fished in the fall after irrigation season when the water goes back to Spring time levels, and, I hope, temperatures and carp activity. We still have full canals but won't be long before they are lowered. Good for your river, I'm jealous that I've no small urban stream, more than for carp, those I have. Oh yeah man, you gotta check it out if you get a late surge in water levels! An odd change like that is going to be one of two things, worthless or gold and you never know till you check it out. Certainly if you got that in the late summer it would be gold, hard to know later in the season. 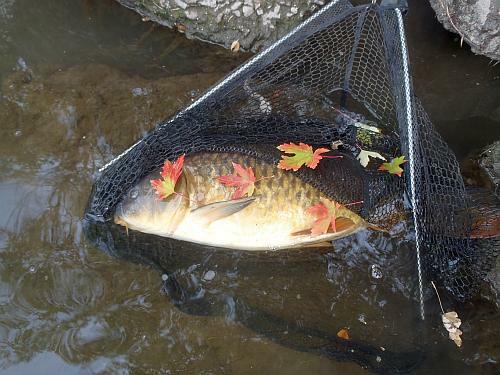 Cool shot with those leaves on the carp. We won't see that kind of color in the trees for a few more weeks down here in GA. I was surrounded by those colors today. Very pretty day. Wow. I agree, who needs beer if there's megacarp to quench your thirst! Gonna have to make some brewing friends. Who knows, carp-lager? Maybe then I would like beer more. A perfect way to celebrate Oktober-Fest!